My name is Alexander and I live in Moscow Russia. I would like to say how i appreciate all your activities in the DIY speakers design ,acoustic research and self made electronic in the internet . 5 years ago after long and unseccessfull attempts to find the audio nirvana in the production range of speakers i started to make speakers myself - begins with Fostex drivers in the backload horns FE168 ,126 and 108 series - but i did not like it very much. Next step was open baffle with 15 inch Altecs and M19 clones - this was a little bit over the top for my room. For the last 2 years I made 4 constructions from your site and all of them are sounded great. The constructions are EEKELS MINI,AT-SW (slightly modified),CNO-2 (in the recalculated bookshelf box),W15CY001 + Hiquphon OWI. I also made 2 bookshelf construction from Klang und Ton magazine - also not in my sound taste. All wood works and crossover assembly was made by myself . For my ears W15 and CNO-2 sounded best in my room - others are also excellent speakers - but sound little bit different.All construction not finished yet - still compare them between each other - to select the best and apply finishing .Off course they can not be compared to the nice cabs in the photos of other builders on your site - but they sound wonderfully. I am prepared for the next construction - ELLAM FLEX 2W for the nearest future -already collecting parts for it - hopefully i will finish it in summertime this year . 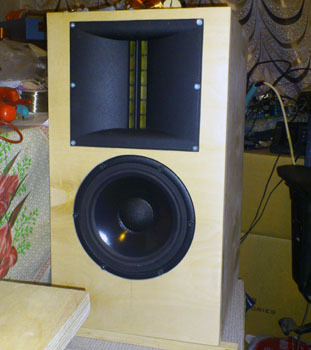 I am attaching the picture of my speakers - sorry for the quality - pictures was made by phone. 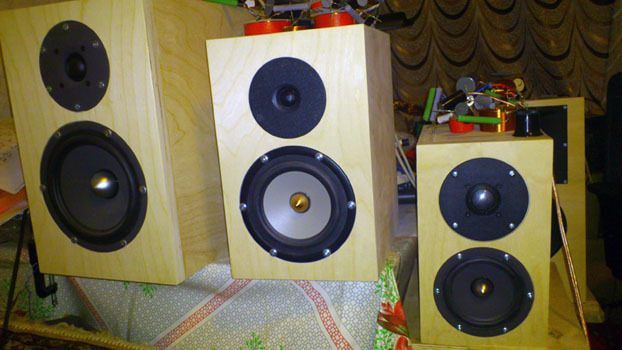 Thanks again for your sharing of this excellent designs and information regarding DIY speakers and other components.